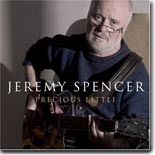 Former Fleetwood Mac guitarist Jeremy Spencer re-surfaces after a long absence from the music biz with a stunning CD, Precious Little on Blind Pig Records. It's this month's Pick Hit. Austin, TX guitarist Seth Walker checks in with a fine self-titled release on Pacific Blues, our Surprise hit for the month. The great harmonica player William Clarke, who passed away 10 years ago, left behind enough unreleased tapes to make up two volumes of excellent recordings from his early years. Both volumes are reviewed in our Flashback section. This month's What's New section features new releases from The Fremonts featuring Mighty Joe Milsap, Mitch Kashmar, Bill Perry, The Hellhounds, Martin Pugh and Stan Ruffo, and more, plus a DVD release of a recent live Bonnie Raitt performance and a 30 year retrospective of the Stony Plain label.